Well, I would hate to do it [shut down mosques] but it’s something you’re going to have to strongly consider. I want surveillance of certain mosques if that’s OK. We’ve had it before. You’re going to have to watch and study the mosques. Because a lot of talk is going on at the mosques…Under the old regime [Bush administration] we had tremendous surveillance going around and in the mosques in New York City. In 2012, 2008, 2004, 2000, or 1996, this stuff would not fly and Trump would be done. What’s going on? Why is he still here? To this point, I’ve been relatively unconcerned by Trump–I was quick to point out that on a number of issues Trump is considerably more reasonable than many other republican candidates. He was against the Iraq War in 2003, he has supported single payer healthcare in the past, and he supports campaign finance reform. That said, his tax system is bonkers and his immigration policies are deeply misguided. But in any case, he’s unlikely to win a general election, and if he were to do so he would immediately find himself stifled by congress and the courts. The American political system is very good at preventing politicians from getting things done. He’s not the only one–Ben Carson taps into this too, as does Bernie Sanders on the left. But the way Trump does it is different. Bernie Sanders wants a political revolution from within. He wants to see a massive boost in voter turnout elect not only himself but many people who will support his policies in congress. Bernie Sanders channels hostility toward government policy, but he has spent his entire political career trying to fix the system from within. Trump wants to run the government the same way he runs the Trump organization–with himself alone at the top answering to no one, certainly not the stupid politicians. He will say and do whatever he deems necessary to get his way, precedent be damned. Carson would like to do what Trump does, but Carson doesn’t quite have the polish to pull it off. He’s much less comfortable dealing with the press and much less effective in his use of TV and social media. Carson is a genuine political outsider, he doesn’t really know what he’s doing and that’s catching up with him. Trump has spent his entire life in front of cameras, manipulating the press and his various business associates. Trump knows exactly what he is doing. The American people remain committed to democracy in principle, but in practice we have very little confidence in the actual institutions that make up democracy. There is more and more support out there for politicians who will disregard those institutions and take actions that deeply undermine them. You can attract support by promising to use legislative tricks to shut the government down (Cruz), you can do it by promising to nullify the decisions of the judiciary (Huckabee), you can do it by overriding congress with executive orders of dubious legal standing (Obama), and so on. But Trump has found the ultimate trump card–he implies that he will do away with stupid politicians altogether. He doesn’t make it explicit, and he certainly doesn’t explain how. Whenever you ask him, he gets very vague. “We need good management.” “We need to be smart”. “We need the art of the deal.” What does all of this mean? Trump doesn’t promise to work with anyone to govern by consensus or compromise. He implies he’s willing to break the system, without explicitly saying so. The public would not tolerate a politician who was explicitly against the political system, but it is happy to embrace a politician who consistently mocks it, who shows no respect or regard for its institutions or norms of conduct. I don’t like making Nazi comparisons–they’re emotionally charged and often highly unfair. But in the last week, the things Trump has been saying are eerily reminiscent of the kinds of things that right authoritarian politicians claim when they are trying to win a democratic election for the purposes of doing away with that system. There’s a group that is demonized (immigrants and Muslims), there are draconian policies to deal with the “problem” group (the wall, the database, the ID cards, surveillance, closing mosques), the politicians who disagree are accused of ignoring reality, and ordinary folks who disagree are condemned as troublemakers or enemy sympathizers who ought to be “roughed up”. Right authoritarian politicians emerge in democracies when there is a group of people who feel that the democratic system exists to take things away from them and give those things to other people. During the Obama administration, the Republican Party has consistently nurtured this belief among its supporters–that the government and the democrats want to take things from them and give this “free stuff” to “those people” (the poor, the blacks, the immigrants, the Muslims). When Mitt Romney said that his party is going up against “the 47%” who do not pay income tax, the implication is that politics is a class war between the Americans who work hard and have stuff and the Americans who are lazy and take things. 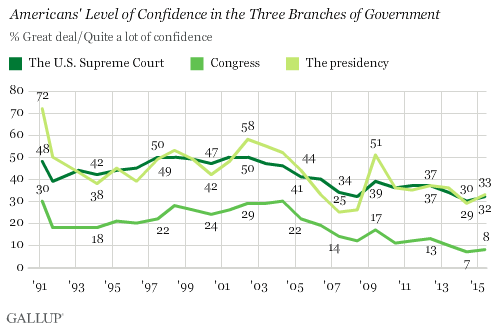 The republicans were overwhelmingly confident that they were going to win in 2012. When they lost, the implication was that there are too many “useful idiots”–those willing to help the 47% take things–for the republicans to take the presidency. And while some republicans believe that 2016 will be different, there’s a chunk of these people for whom 2012 established more deeply than ever that the only way to stop the 47% from taking their stuff is to use all available means. On internet forums, these people contemplate armed rebellion, they stockpile gold, and they look for a great leader who can protect them from the left. This chunk of republicans believe that their country and its values are under attack, that they themselves are going to be expropriated by a government permanently captured by socialists. Fox News, conservative talk radio, and the Republican Party itself have all deliberately fed into these fears to mobilize support for republican candidates. As time progresses, these people grow steadily more desperate and steadily more willing to do things that most of us would consider unthinkable. They believe that Donald Trump is their guy. Is he? Maybe, maybe not. But he sure knows how to use them. And the trouble with using these people like this is that you cannot use them without creating more of them and without making the ones we already have more reactionary and extreme over time. We don’t have a draft anymore–our military is all-volunteer, and because much of the left disdains the armed forces, reactionaries are over-represented in the military. As time progresses and the Republican Party continues to encourage this zero sum view, they are inadvertently potentially creating a situation in which our state could be captured by right wing authoritarians, either through the election of a figure like Trump or through a military coup. While folks like Hillary Clinton and Jeb Bush pretend it’s 1996, our political system is devolving in dangerous and sinister ways. Donald Trump may personally turn out to be harmless, but his supporters are anything but. It probably won’t be this year or this election, but every four years these people seem to be stronger and more influential in the Republican Party. If we continue down this path, we may live to regret it. Four quick thoughts inspired by your very interesting essay of angst. (a) The 1800 presidential election, during which Jeffersonians claimed Federalists were over-educated elitists while Federalists countered that Jeffersonians were ignorant Francophiles who preferred the emotional chaos of mob rule to reason and the rule of law. It was said feelings ran so high in this early era a Federalist would cross the street rather than pass by a known Jeffersonian and a Jeffersonian would sooner club the Federalist in the head than pass him by. (b) The Jacksonian revolution triggered by the election of 1828, which led to over a decade of basically one-party rule, accompanied by increasingly violent clashes between “whole hog” Democrats who accused their opponents (often called “milk and cider” Democrats, later Whigs) of being hateful elitists while the opposition labeled whole hog Jacksonians as “loco foco” for being utterly stupid, uneducated, and incompetent. Murders among opposing voters were not uncommon. Congressman shot one another in duels. 3. Among the poll-leading GOP presidential candidates there is not one who is sufficiently knowledgeable or intelligent enough to fill a high public office, never mind the presidency. But we’ve survived incredibly stupid or uninformed presidents before. (Warren G. Harding and Ronald Reagan spring to mind). I don’t want to trigger Godwin’s Law, so I won’t mention the implications. With the exception of the last 3 words I would say if we continue down this path we may live, period. Otherwise my husband may have to throw a tent over me before I can go out in public. God forbid men control themselves in the company of a woman showing her ankle. Trump gets to the point, and yes there are able bodied people willing to take what other people work for. I really admire you but my guess is as brilliant as you are it is from a sharp quick mind and the luxury of the time to observe. I am a compassionate person and also very observant but my observation point was from the trenches. Makes a big difference. 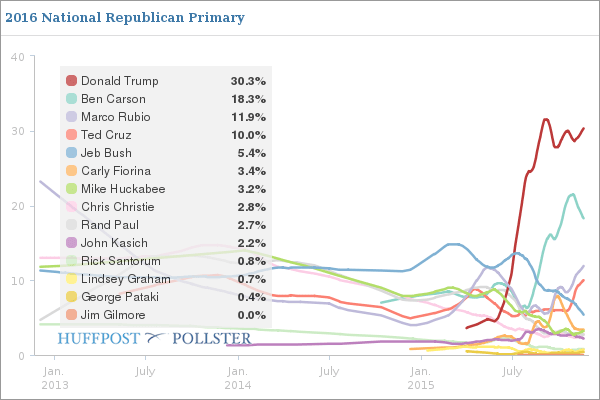 Don’t underestimate Ben Carson’s effectiveness with the media either. Remember the prayer breakfast? Remember the response? Hmmm. Never underestimate the power of a political figure in a level of influence to empower those who are not under direct control of the government; this is the true power the President of the United States has with the people. Put another way, though men/women like Trump may be up against a wall with our Legislative/Judicial branches, there’s little Congress and the Supreme court could do to stop people from making their own decisions, without government policies. As a conservative, it’s disappointing to see Trump take his campaign and bluster to these levels. What’s more disappointing is to see his poll numbers continue to rise. I thought after the first debate that he was through. Now I’m thinking that he’ll be through after the first primary. I’m hopeful my next thought isn’t that he’s only a one term president.